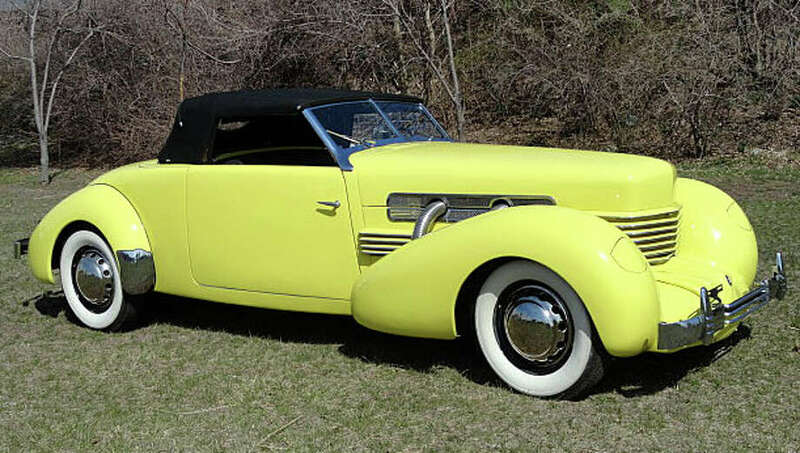 Dragone Classic Motorcars on Post Road West -- where auctions of classic and vintage vehicles such as this 1937 Cord 812 SC Sportsman in May -- will be the scene Sept. 28 of the Road & Tracks celebration. Cars of all kinds will be the focus of the Road & Tracks celebration and the Remarkable Radio Road Rally on Saturday, Sept. 28, in Westport. Car enthusiasts are invited to take the road in a day-long 140-mile road rally followed by a celebration and show of vintage and performance automobiles. The rally revs up at 9:30 a.m. at Dragone Classic Motorcars, 273 Post Road West. The rally will be administered by a professional rally master and will be a TSD (time, speed, distance) event with up to 100 vehicles expected to compete on the multi-state course. There will be a live broadcast of the rally on radio station WPKN's "The Car Bob Show" which is sponsoring the day's events as part of the station's 50th anniversary celebration. An awards ceremony at Dragone's showrooms follows the rally at 4 p.m. with trophies awarded for several categories. The Road & Tracks celebration begins at 7:30 p.m. and will feature live classic jazz, food and drinks as well as the car show. Proceeds from the day's events will benefit WPKN radio, and the KEYS (Kids Empowered by Your Support) program. "WPKN is proud to help support this organization, whose mission is to bring one-to-one instrument lessons and group music instruction to under-served inner-city children in Bridgeport," said Dr. Richard Epstein of Westport, WPKN programmer and chair of the event. WPKN is an independent, non-profit radio station on the campus of the University of Bridgeport.